Paul “Curly” Armstrong was a star athlete at Central High School in Fort Wayne , Indiana. He played basketball for the University of Indiana for three seasons. 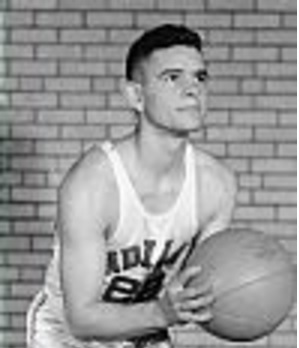 In his junior year, Indiana won the NCAA championship. Armstrong spent his entire eight year professional basketball career with the Fort Wayne Pistons. Armstrong was a starter every year except his final season when he was injured. He was a first-team NBL selection in 1943. During Armstrong’s years with the team, the Pistons won three league championships and three World Pro Tournament titles. Paul Carlyle Armstrong Born: Nov 1, 1918 Died: Jun 6, 1983 Hometown: Fort Wayne, In.